For The Story So Far Official Merchandise, you can pre order here. A show that we’ve been waiting for is finally happening. It’s no secret that THE STORY SO FAR, composed of Parker Cannon (vocals), Kelen Capener (bass), Kevin Geyer (guitar), Will Levy (guitar), and Ryan Torf (drums), are one of the most requested pop punk acts in the Philippines. Now, at long last, the clamor has been answered—PULP Live World is excited to announce that The Story So Far will be coming to Manila for the very first time. 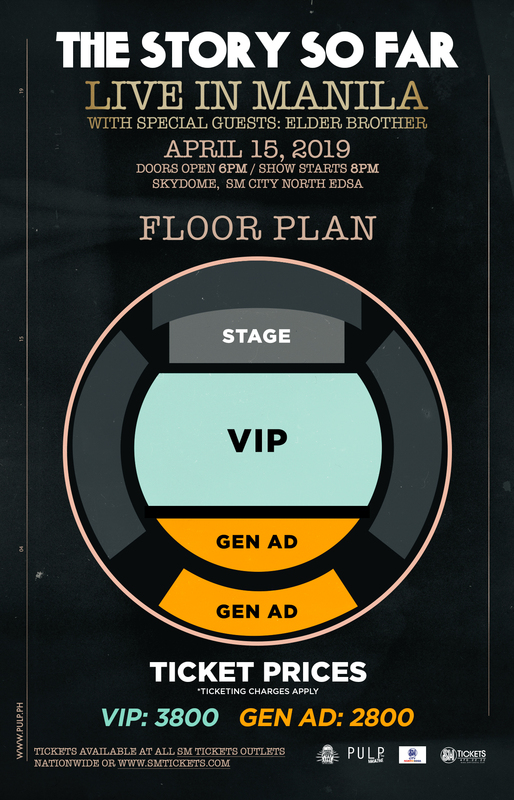 THE STORY SO FAR Live in Manila with special guests ELDER BROTHER is happening on April 15, 2019 at the Skydome, SM City North EDSA! Over these recent years, we witnessed a growth in the Philippine community of pop punk fans, coinciding with what people across the globe saw as a “resurgence” of the genre. The burgeoning scene, which collectively rallied to “Defend Pop Punk” – a battle cry we must attribute to our friends from Man Overboard – stormed fans that had an ear for a newer wave of bands, and The Story So Far are among those that found themselves at the forefront of this movement. This earned them a growing number of fans not just in North America or Europe, but in Asia as well. The band was formed in Walnut Creek, CA in 2007. With their first two albums, Under Soil and Dirt (2011) and What You Don’t See (2013), they made their mark, with an impact that had them hailed as the torchbearers of the current pop punk scene. But with their latest album, The Story So Far managed to push the genre and transcend its limits to breathe new life into their music. Released in September 2018 under Pure Noise Records, Proper Dose is the band’s long-awaited fourth full-length album, coming three years since their fan-favorite self-titled release. “We’re just trying to grow and become a real band. There are a lot of people out there who still deny us, because of the subgenre we’ve been locked in for the past few years, but I think that with this record, those people can’t deny us anymore. They can’t deny us being a good band, being a raw and real band, doing what we want and attempting to be better,” Parker Cannon tells Kerrang! They’re a band living in the moment and situating themselves at this point in time, rather than staying comfortably within the confines of a scene they’ve represented for years now. 2018 has been quite a huge year for The Story So Far, with a massive 22-stop headlining tour in the US in support of the new album. The tour ended with a gig at the massive Hollywood Palladium in Los Angeles, which sold out just a day after tickets went on sale. Hot on the heels of their latest release and the success it’s getting, they will be making their way to Japan and Australia in 2019 to further promote Proper Dose, but not without a stop in the Philippines where their fanbase has undoubtedly grown more solid through the years. Joining The Story So Far in Manila are Elder Brother — a project of TSSF guitarist Kevin Geyer and Dan Rose (Daybreaker). Also under Pure Noise Records, the duo also released their new album, Stay Inside, this year. A fitting addition as support act, the duo’s new album is a manifestation that they’ve found their sound. And despite being a project, Elder Brother is worth as much attention as any other long-standing, more established act. 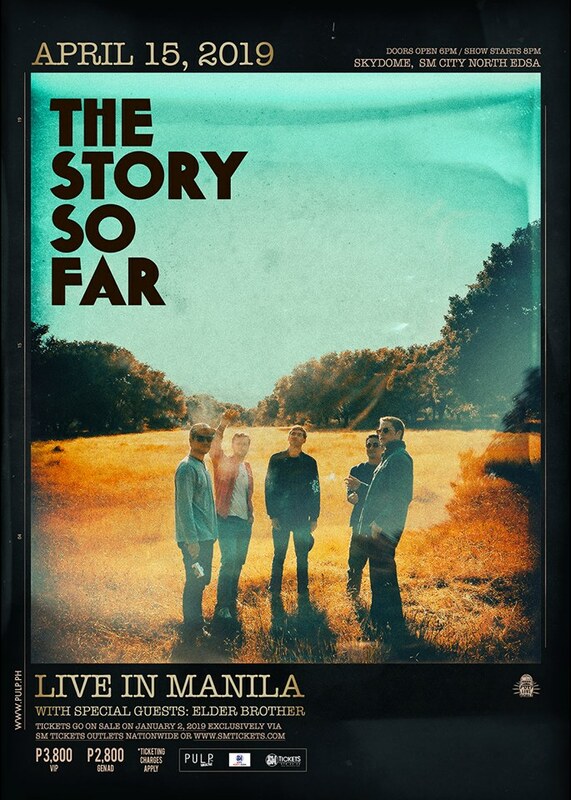 Be sure to save the date—THE STORY SO FAR LIVE IN MANILA WITH SPECIAL GUESTS ELDER BROTHER is happening just before the Holy Week break on April 15, 2019 (Monday) at the Skydome, SM City North EDSA. This show is presented by PULP Live World. Gates open at 6PM and show starts at 8PM. Tickets are exclusively available at all SM Tickets outlets nationwide and online (www.smtickets.com). Tickets are priced at P3,800 (VIP) and P2,800 (General Admission). Ticketing charges apply. Stay tuned for updates by following our PULP Live World social media accounts on Facebook, Twitter, and Instagram, and visit www.pulp.ph for more show information.